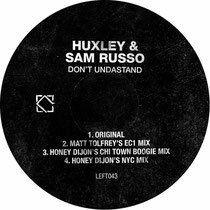 Leftroom Records kicks off 2014 with a remix EP for Huxley & Sam Russo’s, ‘Don’t Undastand’ which sees label boss Matt Tolfrey deliver a remix while Chicago-born Honey Dijon supplies a NYC Mix alongside a Chi-town Boogie Mix. ‘Don’t Undastand’ starts off proceedings with serene piano chords building into intoxicating rhythms and catchy, enveloping melodies arranged over an echoing vocal. Matt chops things up for his Don’t Undastand EC1 Mix with broken drum patterns and whirring atmospherics, holding the soulful vocal back until the latter stages of the track. Fresh from a compilation for Classic Records Miss Honey Dijon gets straight into afterhours therapy with her NYC Mix – a punchy, energy driven track with submersed resonances while her Chi-town Boogie Mix is a much deeper, warmer and bass driven affair. The EP is out 10 February on Leftroom Records, check it out below.